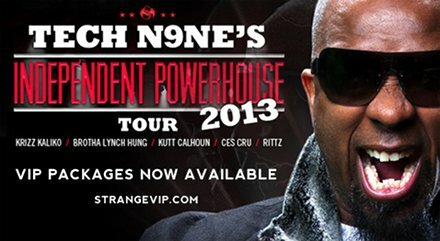 ATTENTION: 2nd Night Added In Albuquerque, NM For Tech N9ne’s Independent Powerhouse Tour 2013! Fans in Albuquerque, New Mexico: you thought VIP was sold out for the Independent Powerhouse Tour 2013? Think again! Due to intense demand, Strange Music is pleased to announce an added show in Albuquerque, New Mexico for Tech N9ne’s Independent Powerhouse Tour 2013 also featuring Krizz Kaliko, Kutt Calhoun, Rittz and CES Cru. To accomodate our fans, the second show in Albuquerque will be on March 25, 2012 at 7PM at the Sunshine Theatre. VIP Passes and tickets sold out quick for the first show so make sure you get yours before they sell out again! Click here to order your VIP Packages and Tickets today!